Hi all! Happy Father’s Day!!! 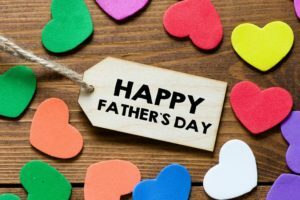 I hope you all are having time to celebrate a father today – those dads are so important! Although…is it just me, or is it all but impossible to find a father’s day gift usually? Man. Seriously. Last year I bought Big Tone a bunch of new shorts for summer. This year, he doesn’t need shorts. Or another golf shirt. The best present I ever found for him was right after we’d had Tackle. We had just finished college, had student loans, had a new baby, and were broke. Big Tone likes cars and always has, and he takes good care of his cars. So that year, I gave him two rolls of quarters to make it easy to hit the car wash. But now, we’re older, we have our own businesses, and we have accounts at a car wash. So…no dice. I was getting my hair cut by Niki at Shape salon last week, and Heather, who owns the awesome place, mentioned what she was getting her husband. And it was freakin awesome, so I totally copied her. Big Tone isn’t one for desserts, except for…cheesecake. Plain cheesecake with no toppings. And Heather told me about a monastery in Vermont where nuns create the best cheesecakes ever. Yeah. I know. Nuns in Vermont and cheesecake. LOL! 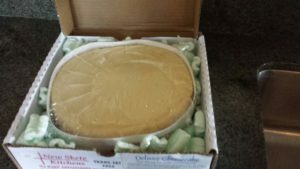 So I ordered Tony a cheesecake made by the nuns in Vermont. 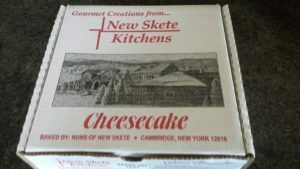 Yes, the shipping cost as much as the cheesecake, but man, it looks good. He’s at the lake right now, and I’ll give it to him later, but I’ll let you know what he thinks. For my dad…well, he doesn’t need another golf shirt, either. (And I think that’s what Deb got him, anyway, so I can’t get that). I found a couple of books for him, one about what dogs think. LOL! My dad and his dog, Sammy, are very close. Sammy even goes to the office with him and also celebrates Cheeseburger Thursday way too often. So I think Dad will be amused. Anyway, I hope you’re having a lovely day, wherever you are. Just a quick note that WICKED RIDE releases on Tuesday. It’s the first book in the Realm Enforcers, which is a Dark Protector spinoff. (Yes, you’ll see some Dark Protectors in there.) I’m posting Chapter 1 early Tuesday morning. Wicked Ride was preordered when you first mentioned it months ago. I can hardly wait for it to arrive! I hope you are enjoying the summer weather, family & fun, but also writing so fans like me have something to read ;-D Write on! I can’t wait for tomorrow either! Woot!